When President Donald Trump announced his intention to pull the world’s second largest emitter of greenhouse gas emissions out of the Paris Agreement, there was understandable concern. But much of the United States pledged to continue moving forward with climate action anyway, and a report finds their commitments could be very significant. 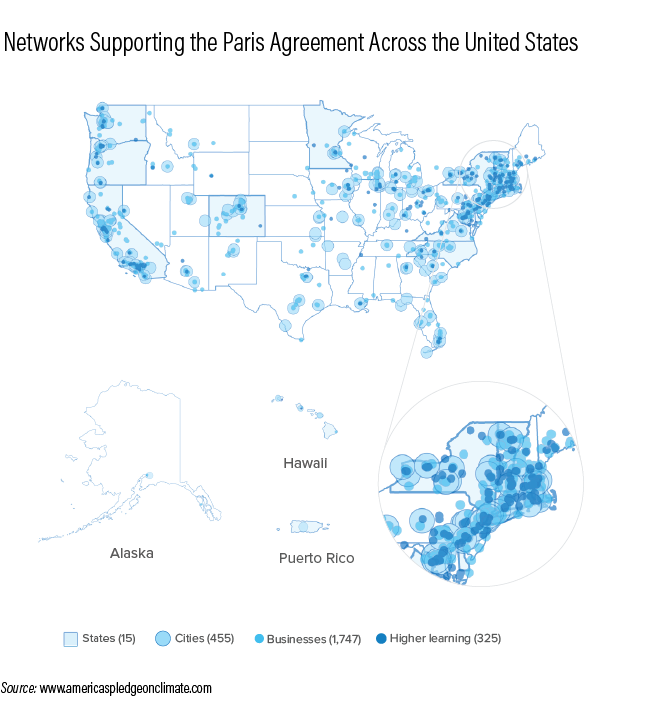 According to new analysis, more than 2,500 non-federal actors representing more than half the U.S. economy – including cities, counties, states, businesses, colleges and more – have pledged their support for the Paris Agreement goals. If these cities and states were their own country, they’d be the world’s third-largest economy. 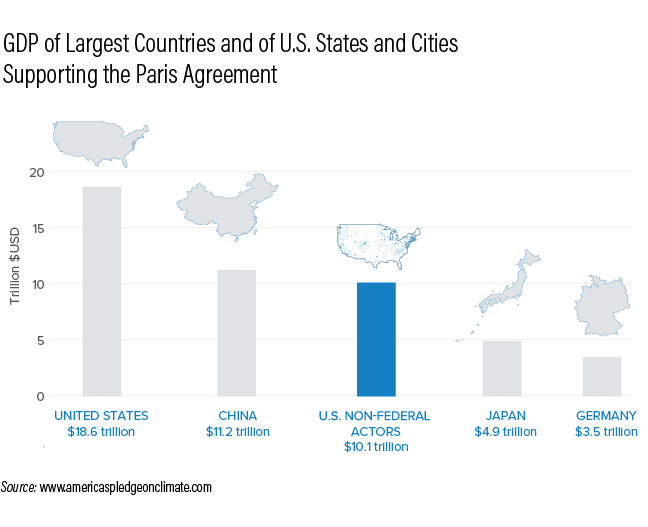 This research is presented in a report by America’s Pledge, a new initiative led by California Governor Jerry Brown and UN Special Envoy on Cities and Climate Michael Bloomberg to quantify the climate actions and recent commitments from non-federal actors. WRI, along with the Rocky Mountain Institute and CDP, conducted the analysis for the Phase 1 America’s Pledge Report released at COP23 in Bonn, Germany. Electricity Generation: Twenty-nine states, representing more than half (56 percent) of retail electricity sales in the country, have mandatory renewable portfolio standards, with nine others setting voluntary renewable energy goals. Transportation: Thirty U.S. cities have committed $10 billion to purchase 114,000 electric vehicles (EVs) for their municipal fleets – a number roughly equivalent to all the EVs sold in the country in the first eight months of 2017. Building and Industrial Energy Use: More than 400 companies, representing more than 13 percent of total U.S. commercial building space, and almost 2,600 industrial facilities have voluntarily committed to reduce their energy use through the U.S. Department of Energy’s Better Buildings / Better Plants program. Methane Emissions: Methane is up to 36 times more potent than CO2, and is emitted from several sources, including landfills. Twenty states have bond, grant, loan or rebate programs that support development of landfill gas-to-energy projects, which capture methane to use for electricity generation. Hydrofluorocarbon (HFC) Emissions: HFCs are up to 12,000 times more potent than CO2 and are used in refrigeration, air-conditioning, building insulation and other applications. Forty-three supermarkets have committed to reducing their HFC emissions, with 533 individual stores certified under this program since 2008. Land-use and Forestry: More than 3,000 communities are implementing urban forestry measures through Tree City USA, including maintaining a tree board or department, and having a community tree ordinance. Cleaner energy and electric transportation are emerging as not just emissions-reduction leaders in the United States, but cost-savings leaders as well. Within the electricity sector, coal is no longer competitive with cheaper renewable energy and natural gas, thanks to state-level clean energy mandates, declining clean technology costs, low-cost and cleaner-burning natural gas, citizen mobilization against dirty power plants and Congressionally approved renewable tax credits. For example, in August 2017, the Department of Energy announced that its “SunShot” target to make solar power cost competitive with conventional forms of energy had been met three years early. Within the buildings sector, energy efficiency gains have outpaced most official projections: since 2005, the Energy Information Agency’s estimate for 2025 total energy use by U.S. buildings has dropped by more than 20 percent. The transportation sector has overtaken electricity as the largest source of U.S. emissions, but is also potentially on the cusp of major change. For example, electric vehicles are widely anticipated to be less expensive and have lower lifetime costs than conventional vehicles by 2025-29. Falling clean technology prices, emerging innovations, and actions by states, cities and businesses have helped reduce U.S. net greenhouse gas emissions by 11.5 percent between 2005 and 2015, while the economy grew by 15 percent over that period. This has allowed states, businesses and cities to take on steeper emissions-reduction targets and accelerated renewable energy commitments. For example, nine northeastern states have implemented the Regional Greenhouse Gas Initiative (RGGI) to create a market-based system that reduces electric sector emissions 2.5 percent a year through 2020. RGGI has reduced power sector CO2 emissions more than 45 percent since 2005 while the region’s per-capita GDP continued to grow. In August, RGGI announced that it will accelerate emission reductions over the next decade to provide an additional 30 percent cap on 2030 power sector emissions, compared to 2020 levels. 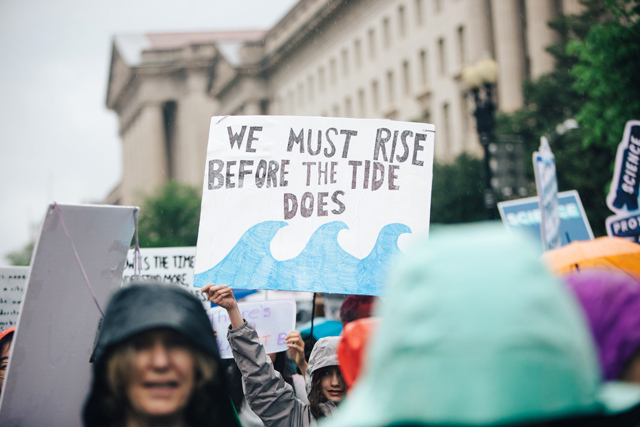 Across the United States, governors, mayors and business leaders are acting to fill the climate action void created by current federal policies. With public support and effective collaboration, they can drive U.S. climate action forward. Indeed, sustained action by U.S. states, cities and businesses can help maintain momentum and lay the foundation for future re-engagement by the federal government after 2020 – which is needed in the long term. In its next phase of work, the America’s Pledge initiative will aggregate and quantify the full range of potential U.S. non-federal actions, including how they affect the country’s ability to reach its emissions-reduction target. In the meantime, expect to see more and more non-federal actors stepping up for climate action. Kristin Igusky is an Associate in WRI’s Global Climate Program. Kevin Kennedy is Deputy Director of the U.S. Climate Initiative in WRI’s Global Climate Program.